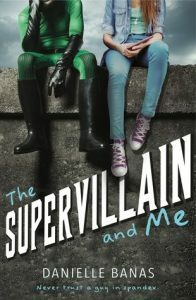 The Supervillain and Me is a fast-paced story with action, mystery and romance. Abby holds her own; a smart, capable heroine without powers in this world of superpowered boys. She also provides humor, calling out the ridiculous tropes of superhero stories and bantering with the Iron Phantom and her brother. Her romance with Iron Phantom is complicated by the fact she thinks he’s the new kid at school, but she can’t be sure. The romance does not overpower the action of the evil plot or the mystery of Iron Phantom’s identity; they all come together to keep the reader engaged. 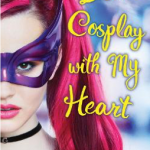 Great for fans of the CW superhero shows like Supergirl and The Flash, as well as Cassandra Clare fans who love action and romance. Sisters Serina and Nomi are merely pawns in a system in which a select few are groomed to become the favored beauties of the royals, and the rest are to serve them. Serina was always expected to woo the royal prince as a “Grace” and Nomi was to serve as her handmaid. When their roles become reversed, Serina finds herself imprisoned on a desolate island. She must fight to stay alive while Nomi must use her new position as leverage in a world of intrigue and deception in order to save Serina from certain death on the island. 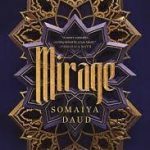 With its fast-paced plot, riveting action sequences, and current topics such as women’s rights and societal expectations of beauty and behavior, this title bursts with reluctant reader appeal and readers will be kept on the edge of their seats. There is some graphic fighting violence but it is approached appropriately in the context of the well-developed fantasy world. 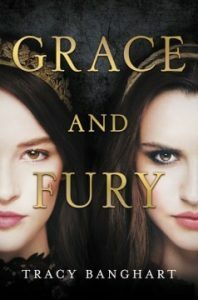 Readers will find both sisters relatable and both are models of strong women in their own unique ways. Perfect for fans of Victoria Aveyard’s The Red Queen series, Dhonielle Clayton’s The Belles, and Suzanne Collins’s, The Hunger Games. Also, give this one a try with viewers of Netflix’s The Handmaid’s Tale. 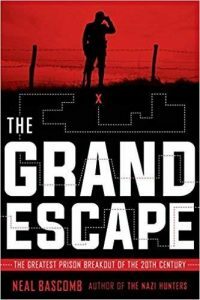 This narrative nonfiction selection follows a group of WWI POWs through their escape from the German POW camp, Holzminden. Allied servicemen David Gray, Cecil Blain, Caspar Kennard, and Will Harvey all find themselves imprisoned in this notoriously brutal prison. They swiftly put their escape plan into action by digging a tunnel beneath the prison, smuggling tools, and bribing guards to keep quiet, right under the nose of Karl Niemeyer, the prison’s ruthless and vengeful warden. Ten prisoners successfully make it out to tell the tale. Readers will be fascinated by Bascomb’s vivid descriptions of stark prison life and conditions, the fear of discovery, and the tunnel engineering as well as the many photographs, illustrations and diagrams, which complement and enhance this richly detailed historical account. Hand to teens hungry for true-life survival and war stories of resistance. Fans of Russell Freedman, Phillip Hoose, or Deborah Hopkinsons’ Courage & Defiance will find these rebels equally engrossing and inspiring. 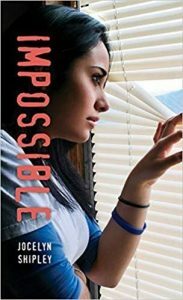 As a single teen mom, Jemma is lucky to have an older brother to help – but she’s alone in the apartment, and has to run out for diapers. She’s terrified that she has to leave her baby Violet alone, but things get really bad when she witnesses a murder . 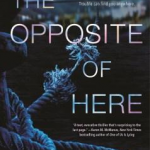 . . and she thinks she knows the killer, whose identity proves a threat to her and Violet’s future. A quick yet powerful read, this book tells a straightforward story as it explores the many conflicts and ethical dilemmas that young mothers can experience as they struggle with love for their children, fear for their safety, domestic abuse, and the law. Readers will turn pages quickly as the pressures build up on Jemma, who must decide what course of action is most likely to keep herself and Violet safe. Titles that explore similar themes include the popular Crank series by Ellen Hopkins and Learning to Breathe by Janice Lynn Mather. Courtney “Coop” Cooper is in love with his next door neighbor and friend, Jupiter Charity-Sanchez. Jupiter likes girls, though, especially Rae Chin. However, Rae has a thing for Coop. Someone is bound to be the odd one out in this love triangle. 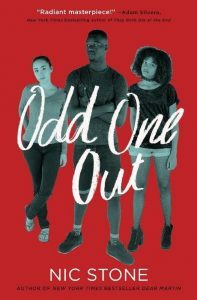 The cover image of the three main characters depicted in black and white against a bold red background catches the eye and prompts the reader to wonder who the odd one out might be. The book’s 320 pages are divided into three books within a book. Each section is then narrated by one of the three main characters in short chapters with clever headings. Kicking off with Coop, the first book captivates readers with his intense friendship and secret love for Jupiter “Jupe”, who has stated her preference for women. Book two is Jupe’s side of things, having more than friendly feelings for her new friend, Rae. In the final book, Rae completes the circle with a crush on Coop. Assumptions, miscommunications, and questioning sexuality throw even more into the complicated mix. Readers will find the quirky spirited characters likeable and complex. The banter amongst Coop, Jupe, and Rae interjects humor into an already intriguing tale. The representation of both cultural diversity and LGBTQ+ diversity is strong and has broad appeal for young adults. 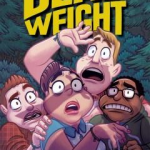 Ideal readers are teens who enjoyed the movie Love, Simon or the television show Glee, which both depict multicultural casts of characters and those questioning/discovering their own sexuality. Similarly, readalikes include Simon vs. the Homo Sapiens Agenda (the book that prompted Love, Simon) and Leah on the Offbeat, both by Becky Albertalli, or Let’s Talk About Love by Claire Kann.